More than a decade ago, the local film “Marriage Is a Crazy Thing” created a sensation in Korean society, where family-oriented values still prevail. The 2002 film revolves around a woman who chooses to wed a wealthy doctor over a man she actually loves, but secretly continues to have an affair after her loveless marriage. Challenging the centuries-old perception of marriage, the rather provocative film shed light on young Koreans’ shifting attitudes toward the institution. The number of marriages have been steadily decreasing, down 7.2 percent from three years earlier. More than half of Korean men in their early 30s were unmarried, while nearly 30 percent of women in the same age group were single as of 2010, according to the nation’s latest census data. The average age of first marriage for Koreans is also increasing, with men tying the knot at 32.2 and women at 29.6, roughly two years up from a decade ago. The reluctance to wed is primarily a result of financial concerns and the unstable situation facing the younger generation in Korea. But some voluntarily choose to remain single to focus on their own lives. Experts say this trend of marrying less and later are casting a shadow over the prospect of the country, shouldering a greater burden on the future generation. Koreans in their 20s and 30s, the sons and daughters of those who achieved rapid economic growth within a few decades, have self-mockingly branded themselves as the “Sampo” generation. “Sampo” is a new Korean term that defines the nation’s youth, who tend to give up three things: dating, marrying and having a child. Among them is a 35-year-old office worker, surnamed Moon. He has been working hard for a Seoul-based trading company for six years, but he still doesn’t feel “ready” to form a family. Moon wants to wait until he is financially settled and has his own house, whether it is rented or purchased. Traditionally, Korean men have been expected to prepare a house and women to fill the home with furniture and appliances. Like Moon, many Koreans are being forced to give up on marriage in the face of a prolonged economic downturn and uncertain future. Of the 13,385 respondents, 87.8 percent of men cited “unstable employment” and 86.3 percent of women pointed to “lack of expenses for wedding” as the biggest obstacles to marriage. Social and economic circumstances for the young have increasingly become more punishing in recent years. The costly education, however, did not guarantee a job. Only 40.5 percent of Koreans aged 15-29 entered the workforce, and, of the employed, one in five landed a job in contract positions, according to government statistics. This employment status affects the odds of marriage. 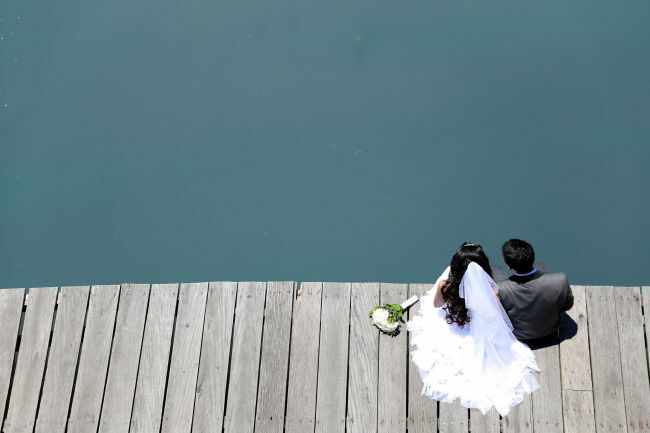 According to research, employees in full-time positions have nearly twice the chance of exchanging vows than Koreans who are either out of work or in temporary positions. Soaring inflation and housing prices do not help. The average price of apartments in Seoul last year hovered around 313 million won, a significant amount given the average starting salary for young Koreans is about 23 million won. The sky-high costs for child-rearing is another factor that contributes to the dwindling marriage rate. “It costs too much to raise a child,” economist Woo, a father of two babies under 2 years old, said of his own experience. It is estimated to cost more than 200 million won for parents to bring up a child until their offspring enters university, according to KIHSA. This expense could easily surge even more, considering Korean parents’ near-obsession with education to ensure their children succeed in life. The economist Woo believes that only drastic government action, such as raising the minimum wage, expanding welfare and generating more jobs for youth, could ease the burden. “Unless the government reforms the social structure that passes the responsibility of child-bearing along to individuals and families, the marriage and birth rate will only continue to fall,” he said. The changing marriage patterns ― the delay of marriage or non-marriage ― have been prevalent among young women with more education. Kim Su-jin, an employee at a state-run organization, admits that she considers putting off marriage. Kim is aware that there would not be many men who can understand her passion for work and hectic schedule, which involves countless overseas trips. “So I will wait until the right one comes along,” she said. Kim is only one example of the young, educated women who juggle their options between marriage and a career. “Nowadays, the social pressure that has forced a woman to marry has abated,” said Lee Soo-youn, a senior research fellow at the Women’s Development Institute. “Korean women do not need to rush into marriage anymore as they have a job and income. Unlike the old days, they don’t have to financially rely on their husbands,” she said. In a patriarchal society, however, educated women are left with fewer options for partners. In fact, a survey indicated that more educated women are less likely to walk down the aisle. Women with secondary education stand a chance to tie the knot ― nearly 8 percent more than those with university degrees. But such a tendency is one of the factors behind the country’s low birth rate, experts say. The number of children the average Korean woman can expect to have during her lifetime ― the fertility rate ― currently stands at 1.25, the lowest among OECD countries. Cho Sung-ho, an associate research fellow at KIHSA, pointed out that non-marriage means no childbirth in Korean society. “In Korea, having a baby out of wedlock is socially not acceptable,” Cho said. “The low birth rate will reduce the working population, and this, in turn, will lower the tax revenues needed to support the fast-aging society,” she added. While the faltering economy continues to weigh on the younger generation, there are some people who break away from Confucian ethics and opt to lead a single life for their own sake. Lee Sung-hoon, an office worker based in Seoul, is one such individual who is defying the institution of marriage. Thus, he is challenging a social taboo ― cohabitation without marriage. “I don’t see the necessity of marriage. It has become no more than a marker for social status,” the 30-year-old said. Rather than going through the “time-consuming” marriage process, Lee and his girlfriend chose to live together without marrying. Lee’s story is a reminder of younger Koreans’ attitudes towards cohabitation that has long been frowned upon in the conservative society. A government survey released last year showed that nearly half of Koreans over the age of 13 advocated cohabitation without marriage. In an even more drastic departure from tradition, 22.5 percent of respondents gave the nod to having a baby without marriage. According to sociology professor Koo Jeong-woo at Sungkyunkwan University, the trend is a sign of changes in the fundamental values that govern the lives of Koreans. “In general, Korean society has stressed hierarchy and the individuals’ duty for family and nation on the basis of Confucianism,” said Koo. But there are still more and more Koreans like Lee who put self-satisfaction before family virtues, like Ha Gyeong-rok, who works for a Busan-based online advertising company. “I will keep dreaming and doing what I can to please myself. I don’t care about what others think of me,” Ha said. In light of the emerging trend of singledom, professor Na Eun-yeong from Sogang University said the young generation’s mindset can be largely attributed to the development of social media. “Through social media, the young generation can easily seek support and consolation outside their families,” said Na, who teaches communication studies. Today, what only families could have offered in the past is being replaced by a new type of media that connects individuals across the world, according to Na. “The young appear to prefer to invest limited resources and capital on themselves to fully enjoy their life, rather than form a family,” Na said.